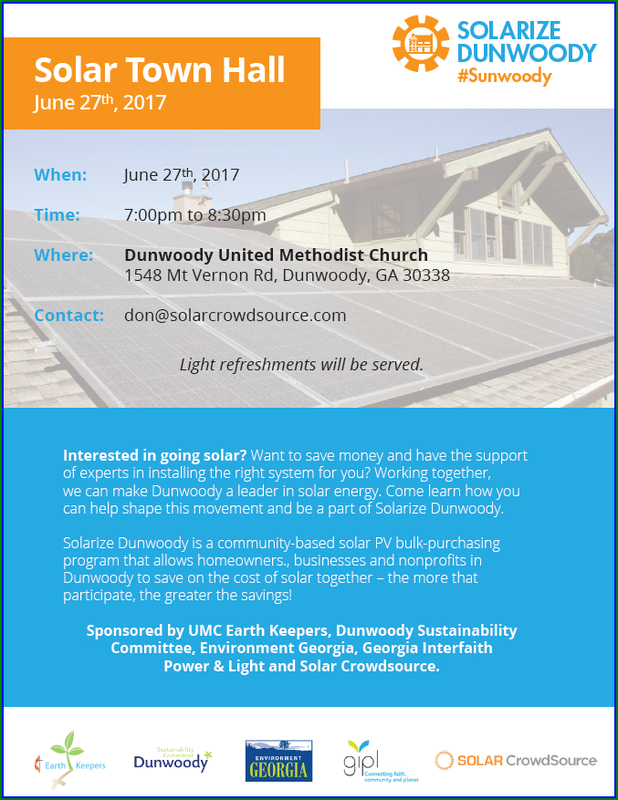 Dunwoody Solar Town Hall, Tuesday 7 pm at Dunwoody United Methodist Church to discuss Solarize Dunwoody - Home Installation. Interested in going solar? Want to save money and have the support of experts in installing the right system for you? Working together, we can make Dunwoody a leader in solar energy. Come to learn how you can help shape this movement and be a part of Solarize Dunwoody (@SunwoodyGA). Solarize Dunwoody is a community based, PV bulk purchasing program that allows homeowners, businesses, and non-profits to save on the cost of solar together---the more that participate, the greater the savings! This is a community input meeting where the coalition explains how the program works and asks attendees for input to shape the RFP to choose the vendor. Each attendee is given three stickers and is asked to place each one on a poster representing his/her top three priorities for the program. A friend attended the Solar Town Hall in Decatur and her top three priorities/program attributes were (1) overall price, (2) inverter warranty, and (3) community project. Other options might include warranty on solar panels, panels made in US, local workforce, etc. Sponsored by the Dunwoody Sustainability Committee, Environment Georgia, Georgia Interfaith Power & Light, UMC Earthkeepers, and Solar CrowdSource. 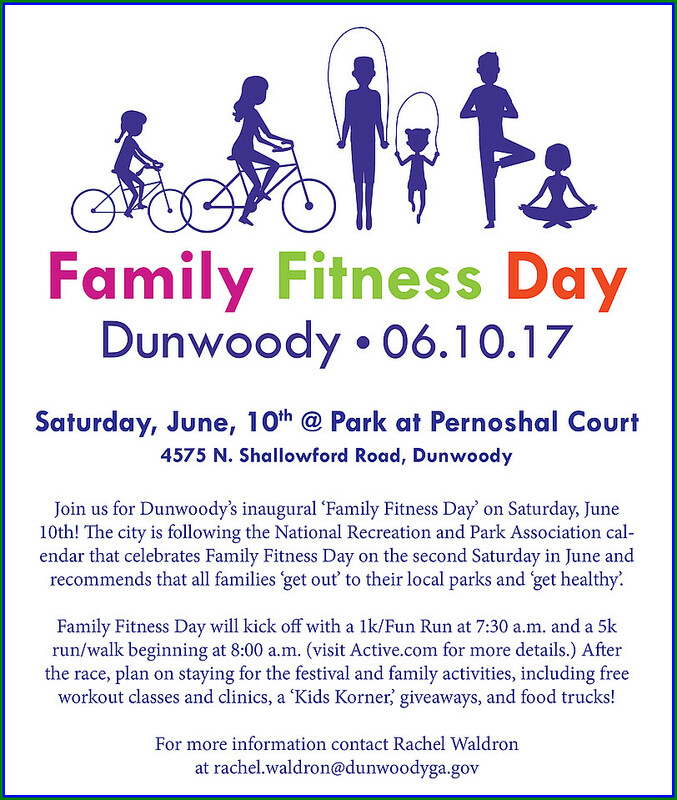 Dunwoody Community event including Dunwoody High School, Peachtree Charter Middle School, Austin Elementary School, Chestnut Elementary School, Dunwoody Elementary, Hightower Elementary, Kingsley Elementary School, and Vanderlyn Elementary School. 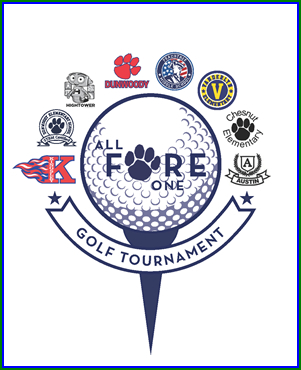 All Fore One Golf Tournament will help raise money to benefit capital improvements and educational enrichment at DHS and PCMS. Principals and parents from the eight schools that make up the Dunwoody Cluster are coming together for the first time to support education in a unique way. They’re organizing an inaugural community golf tournament called “All Fore One” on Monday, October 2, 2017. "The golf tournament was a small idea that grew as the feeder principals talked about the desire to create a sense of community- where neighbors get to know neighbors, where one school supports another, where we realize that we are truly ONE," said Dunwoody Elementary School Principal, Jennifer Sanders. The All Fore One committee is comprised of parent volunteers from Dunwoody High School, Peachtree Charter Middle School, Austin Elementary, Chestnut Elementary, Dunwoody Elementary, Hightower Elementary, Kingsley Elementary, and Vanderlyn Elementary. For the first year, the funds raised will benefit capital improvements and educational enrichment at Dunwoody High School. Looking forward, the tournament will raise money for Peachtree Charter Middle School as well. The high school and middle school will benefit from the tournament in alternating years based on need. Co-chairs Julia LeDoyen and Lauren Middlebrooks said it is a thrill to collaborate on this effort. This year’s proceeds will be directed to the “Game On Campaign” to assist with their efforts to enhance the high school athletic facilities. The event will be held at Dunwoody Country Club, located at 1600 Dunwoody Club Drive. Registration will begin at 8:30 am with a shotgun start at 10:00 am. It will include a box lunch, award ceremony, and raffle. “All Fore One” is seeking early sponsors to be featured on a banner in the Dunwoody 4th of July Parade, the largest of its kind in Georgia. 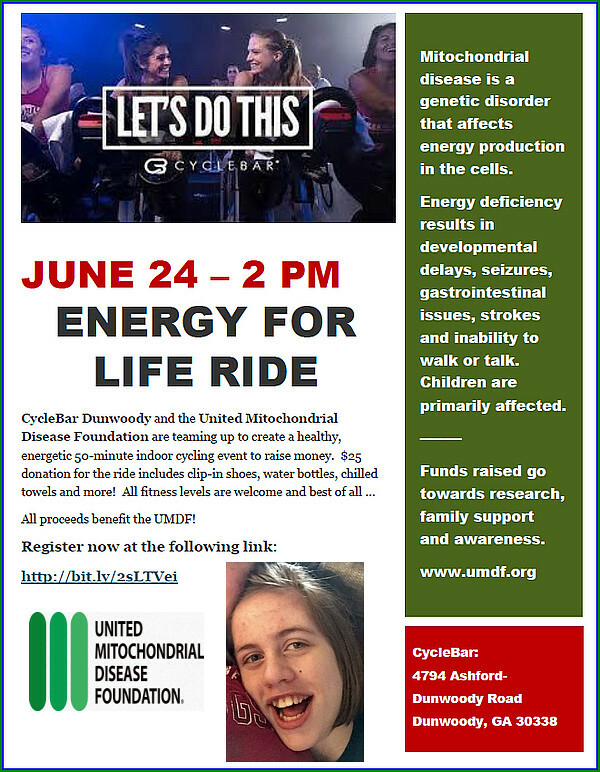 My wife, Gwen, has organized a ride at CycleBar-Dunwoody on June 24 benefiting the United Mitochonrial Disease Foundation. A $25 donation is requested for the 50 min ride and 100% goes to the UMDF. Our daughter, Anna, suffers from this disease and you can learn more at https://www.umdf.org/what-is-mitochondrial-disease/. We are lucky and blessed that she is now 13 years old. We would greatly appreciate it if you would post this on your blog. I have attached the flyer and picture of Anna. We give you permission to post her picture, if you feel its appropriate. Feel free to contact me with any questions. I'm booked for bike #42 who's going to join me? 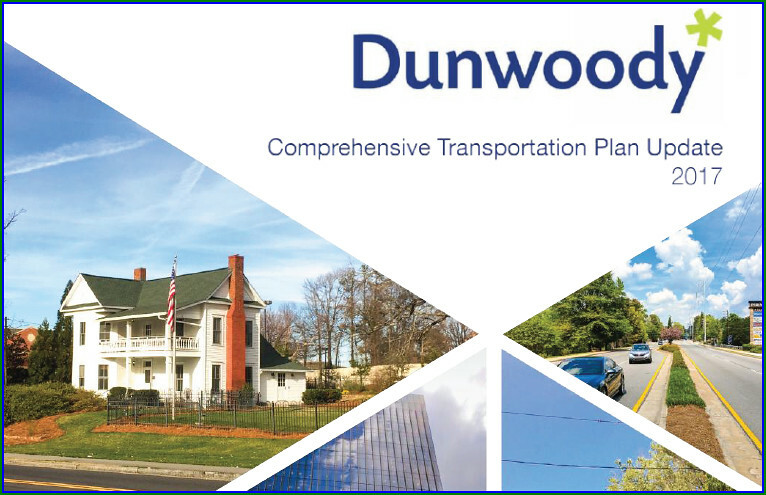 The City of Dunwoody is currently updating its Comprehensive Transportation Plan which outlines the community’s transportation objectives and funding priorities. This plan was originally developed in 2009. Since this time, efforts on several of the prioritized projects have begun and some have been completed. 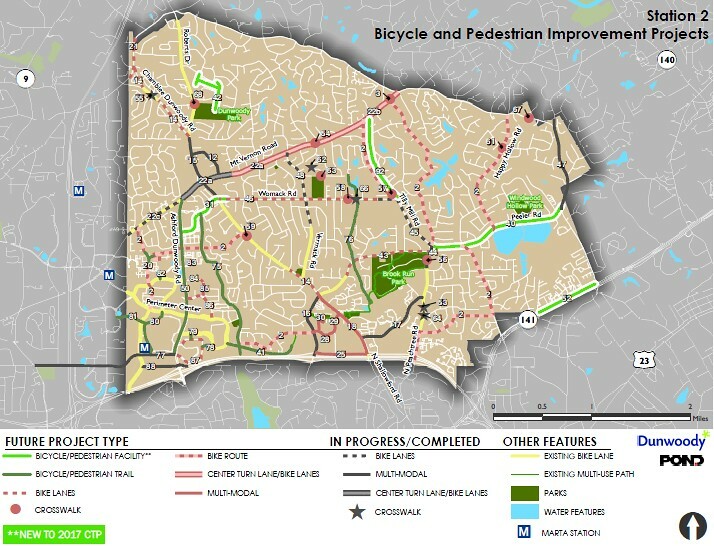 The primary purpose of the five year update is to review and refresh the recommended project list and work program as well as explore enhancements to plan components such as pedestrian and bicycling facilities. A public meeting to discuss this update and the potential new projects, was held on March 7, 2016. The following materials were presented. An update to the plan has been drafted (Draft CTP Update) Huge File 99MB. This item will be discussed at an upcoming City Council meeting. Comments may be submitted via email to public.works@dunwoodyga.gov or mailed to City of Dunwoody Public Works Department, 41 Perimeter Center East, Suite 250 Dunwoody, GA 30346. 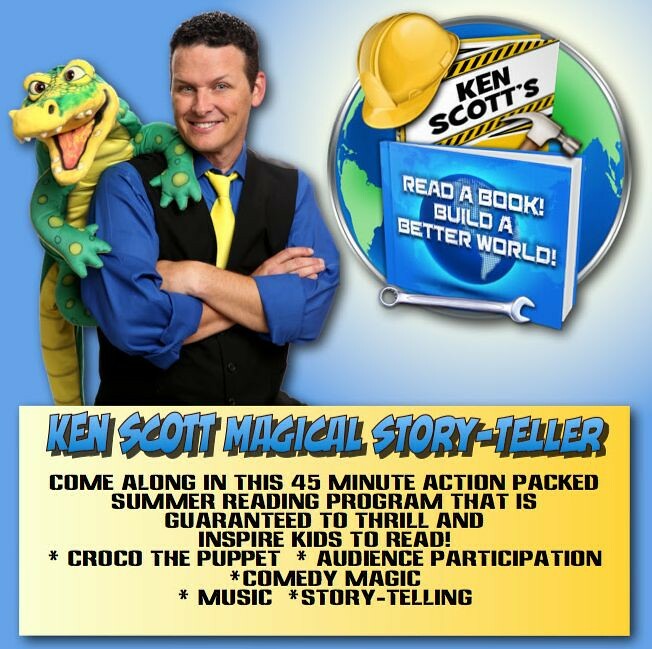 Magician Ken Scott is amazing and I have used him to entertain large groups of children numerous times at my home, if you have little ones please check out the free show. You will not be disappointed. Each summer, Dunwoody celebrates its annual Restaurant Week, during which visitors can sample food and drink from some of the loved and regarded restaurants in the Atlanta area. Participating restaurants will showcase their best dishes and desserts with pre-set lunch and dinner menus. Diners are invited to either call to make reservations or simply stop in to enjoy delicious meals for a steal at favorites that include big-name chains, locally owned restaurants and small bistros. Are you ready to take your dining experience above + beyond your regular routine? Here are 5 reasons why you should be. 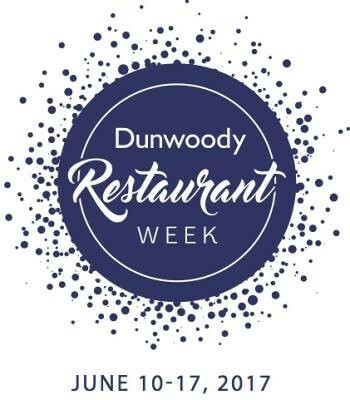 The 6th annual Dunwoody Restaurant Week returns June 10-17th! Participating restaurants, special offers, restrictions and details are listed below, please click the links to view. Bon appétit! 9 am Agenda for Tax Rate Hearing & 6 pm Agenda for Full Meeting. Administer the Oath of Office to Officer Kasey Martin. Recognition of Officer of the Quarter, Detective Caleb Gilbert, and Civilian of the Quarter, Crime Analyst Lisa Lee. Ordinance to Establish the 2017 Ad Valorem Tax Rate. Resolution Appointing Members to Serve on the City of Dunwoody Alcohol License Review Board. Resolution Appointing Members to Serve on the City of Dunwoody Construction Board of Adjustments and Appeals. Resolution Appointing a Member to Serve on the Convention and Visitors Bureau of Dunwoody. Resolution Appointing Members to Serve on the City of Dunwoody Urban Redevelopment Agency. Resolution Appointing Members to Serve on the City of Dunwoody Volunteer Coordinating Committee. Resolution Appointing Members to Serve on the City of Dunwoody Board of Zoning Appeals. Approval of an Agreement with the Georgia DOT for the Perimeter Traffic Operations Program. Approval of a Construction Agreement with the Georgia DOT for the Perimeter CID's Intelligent Transportation System Upgrade Project. Resolution to Update the Alcohol License Fee Schedule. Contract Amendment for City Hall Construction to BM&K Construction and Engineering. 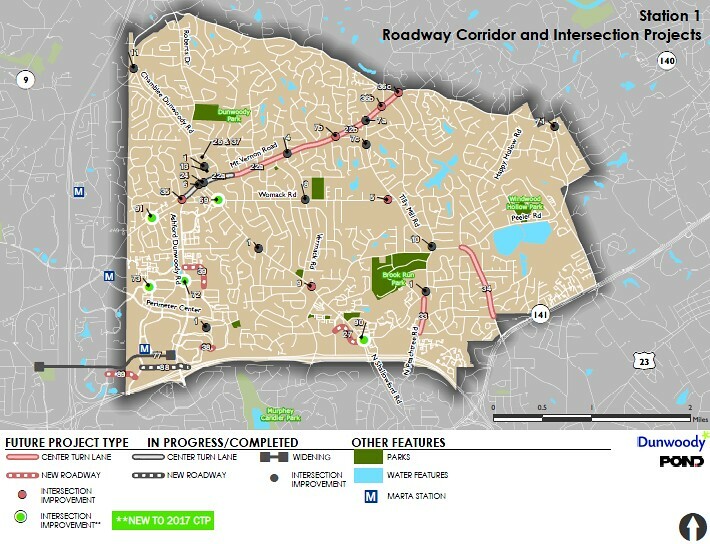 Funding Authorization for North Peachtree Road Traffic Calming Construction. Framework for Hotel Motel Tax Increase. City of Dunwoody Public Facilities Authority.